Detail sanding doesn't have to be tedious work. With the Festool LS 130 Linear Sander and its various interchangeable head shapes, you can sand an inside or outside corner, a radius, or even custom shapes, all without ever having to hand-sand. I love my job, but I don’t enjoy sanding. It’s time-consuming, messy, and all-around boring. Detail sanding is even worse. Getting into corners, sanding curved millwork and profiles, and cleaning up edges requires hand-sanding. I find hand-sanding tedious. Not only is it slow, but it tends to leave more dust lying around since there is no good way to collect it. It also takes its toll on your hands over time. Obviously, I’m always looking for ways to speed up the detail sanding process. When I saw the Festool LS 130 EQ, I knew it was something special. With a wide variety of 13 different heads, it tackles everything from inside and outside corners to various radii. You can even make your own profile head with an optional kit. To me, this sander stands alone in this regard since I don’t know of any other detail sanders on the market with these capabilities. The most impressive feature by far is the LS 130’s ability to swap heads to tackle what is normally a hand sanding job. The head options tackle round material, corners, and flat surfaces. 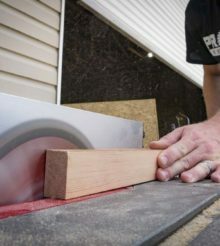 It uses a true linear motion, so it properly imitates hand sanding. Obviously, when you get off of flat materials and wrap around round material or get in and sand a rabbet, random orbit sanding is no longer an option. We’ll get into more detail on that momentarily. The Festool LS 130 is a stroke sander. Rather than sanding in a random orbital pattern, the sanding head on the LS 130 moves back and forth in a linear fashion. In this regard, it’s just like hand sanding. As long as you follow the grain, this sander leaves no swirls or sanding marks behind. This also means that the Festool LS 130 removes material more slowly than what you’re used to from a random orbit sander. With detail sanding, this is a benefit since I don’t want to take off too much material from a profile at once. Even though it sands more slowly than a random orbit sander, it’s still much faster than hand sanding. The Festool LS 130 and its attachments have a variety of grits and paper styles available. This helps because different profiles and different woods call for different papers. Even on a flat surface, the flat pad with a high grit paper will give you an excellent finish, eliminating any swirl marks left by your random orbital sander. The linear motion of the Festool LS 130 makes it easy to control and ensures excellent results when sanding various profiles. I find that it doesn’t have the “grab” that you get with a random orbital sander. It just seems to glide over the surface, rather than sticking. Part of that is the the linear action and low vibration, the other is the ergonomics – it just feels very natural in your hand. Speaking of various profiles, I’ve used about half of the available heads, and every one of them does a stellar job. In my work, the inside corner head gets the most use. It’s very convenient for removing glue squeeze out. The variable speed feature is nice as well. There are definitely times when less is more, especially when working with delicate profiles. How much is your time worth? I know that I’ve devoted countless hours to hand sanding, and the Festool LS 130 nearly eliminates any need to. A couple of passes with this sander and the job is pretty well done. So, from a value standpoint, I give it a 10 out of 10 because I haven’t seen another sander like it, and because it expedites the whole detail-sanding process over hand sanding. If you find yourself refinishing furniture or working with anything involving complex profiles, the Festool LS 130 is a must have product for Pros that value their time. The efficiency you gain on top of the improvement in your work makes this sander well worth the price tag. Remember the Porter Cable Profile Sander? Very similar but with smaller heads.